Illusions and the creator of the game of Duel Monsters, as well as the adoptive father ofYako and Gekko Tenma, Depre Scott and Richie Merced, amongst many other orphans. He owns many cards that have never been released to the public. Pegasus was the main antagonist in the Duelist Kingdom arc; in the manga and Japanese version of the anime, but after Duelist Kingdom he redeems himself. Pegasus tried to take over KaibaCorp to see Cyndia using the company's Solid Vision technology. In the American version of the anime, he wants to take over KaibaCorp and gain possession of the Millennium Items to combine KaibaCorp technology with the items in the hope of reviving his lover, Cecelia. In the anime, he became an ally starting after Battle City. Pegasus is one of the few characters to use his English anime name in the English manga. Although on one occasion, he is referred to by his original name from the Japanese version, Pegasus J. Crawford. Pegasus is depicted as a well-mannered, yet overly dramatic man obsessed with cartoons, concealing the appearance of a ruthless businessman and gamer, yet man of his word. Pegasus has a habit of callingYugi "Yugi-boy" and Kaiba"Kaiba-boy". This trend continues in Yu-Gi-Oh! GX. When sufficiently provoked, he can have a temper. 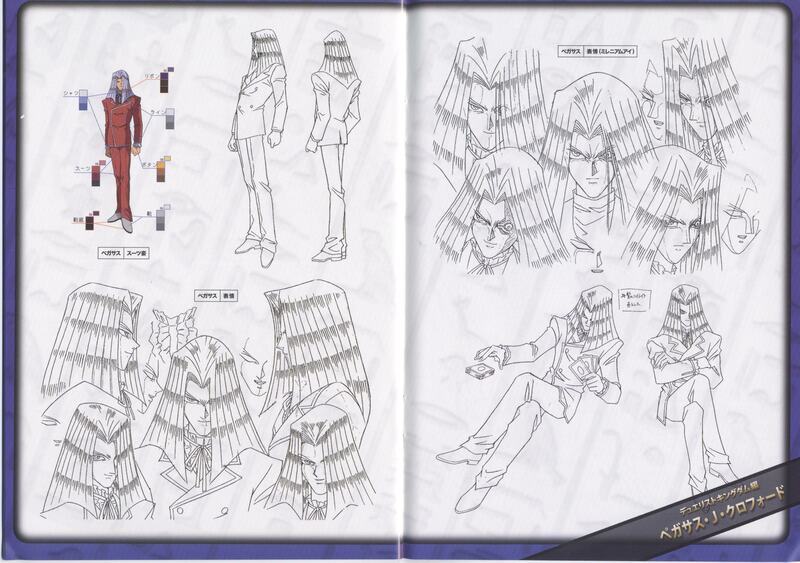 Pegasus is also notable for his foppish manner, dandified appearance, and effeminate hairstyle, all of which have led to him being referred to as "cutie-pie" (by Bandit Keith) and an "overdressed prima donna" (byJoey Wheeler). Pegasus is interested in cartoons, especially Funny Bunny, which he watched every Saturday morning while growing up in America. Cartoons are the inspiration for many of his cards, such as the Toon Monsters. Pegasus at first comes across as a cheater with a thirst for collecting souls and achieving his ambitions. This impression is changed when his true motive is revealed. Not only is Pegasus an excellent business man, his motivations for acting as the above was the resurrection of his deceased lover Cecelia. 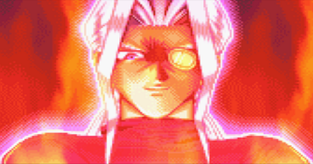 Furthermore Pegasus himself honors his pledge to Yugi Muto claiming to be both "duty bound" and a "man of [his] word", releasing the souls of Solomon Muto, Seto and Mokuba Kaiba before being defeated in a Shadow Game by Yami Bakura. 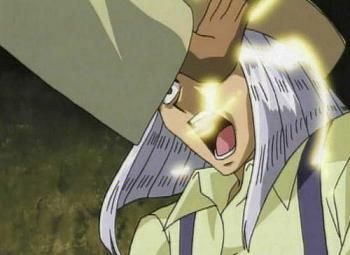 Despite cheating with the Millennium Eye himself, he at least punished Keith Howard for cheating right in front of him; in the anime, he was somewhat light-hearted in this aspect, simply making fun of Keith while dropping him with a trapdoor, but in the manga, Pegasus was deadly serious by personally killing Keith. He does shows a moment of kindness when others needed help or reserved to anything they need. 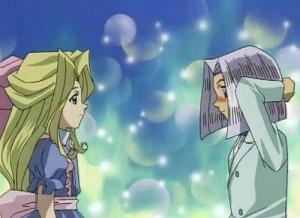 Pegasus first met Cecelia at a party thrown by his businessman father in Las Vegas 14 years before Duelist Kingdom. The two fell in love and made plans to live together. Pegasus often spent time painting portraits of her. (In the dub, the two got married.) Cecelia died of illness at the age of 17.
Pegasus searched the world looking for anything that could possibly revive the dead. His quest led him to Egypt, where their beliefs of an afterlife intrigued him. Pegasus gets the Millennium Eye. Here he met Shadi, the ghost of a guardian of the Millennium Items. Shadi warned him that he wouldn't find the solutions to his problems here and tells him to leave. Pegasus is impressed as he thinks Shadi just read his mind. He ignores Shadi's warning and follows him to an underground temple. After Shadi realizes Pegasus followed him, he puts him to the Millennium Eye's test. If Pegasus was worthy of the Eye, he would be granted his dearest wish, which was to see Cecelia again. Pegasus has his left eye replaced with the Millennium Eye, which Shadi forced into Pegasus' socket. After receiving the eye, Pegasus saw a vision of Cecelia for a brief moment, enough to hug her before returning to reality. Pegasus soon learned of the ancient Shadow Games that were played in ancient Egypt and became obsessed with their powers. Having created Industrial Illusions, he started a new game in the United States, Duel Monsters, a card game based on the duels of ancient times. Combining the magic of the Millennium Items with these cards had the same effect as using them with the stone slabs originally used. On a second trip to Egypt, Shadi took Pegasus to an underground city and led him to chamber, containing a tablet of carvings of the Egyptian Gods. Pegasus then returned to America to create the God Cards, basing them off what he'd seen on the tablet. However, everyone Pegasus employed to work on the God cards died. Despite this, Pegasus refused to stop this project. He continued to paint the God Cards himself. As he did so, he fell asleep and dreamed of a Egyptian city being destroyed by the Gods. Shadi appeared to Pegasus in the dream and warned him of the danger he was unleashing. He told Pegasus that his only hope was to return the God Cards to their resting place. Fearing for his life, Pegasus returned to Egypt, and had Ishizu Ishtar, a current guardian, bury the Egyptian God Cards in the Pharaoh's tomb. In the English version, during some unprecedented time in the creation of Duel Monsters, Pegasus had also traveled to Eastern Asia, where he drew inspiration from the religions and mythologies to create the Spirit monster card variety. Pegasus receives a proposal from Seto Kaiba from KaibaCorp inquiring about developing a Dueling Arenas to amplify Duel Monsters. Pegasus participated in the Intercontinental Duel Monsters Championship tournament and faced Bandit Keith in the finals. Pegasus toys with Keith and reads his mind using the Millennium Eye. He scribbles down some notes and calls a kid, named Sam, from the audience over. He hands Sam the instructions and tells him to use them to defeat Keith. 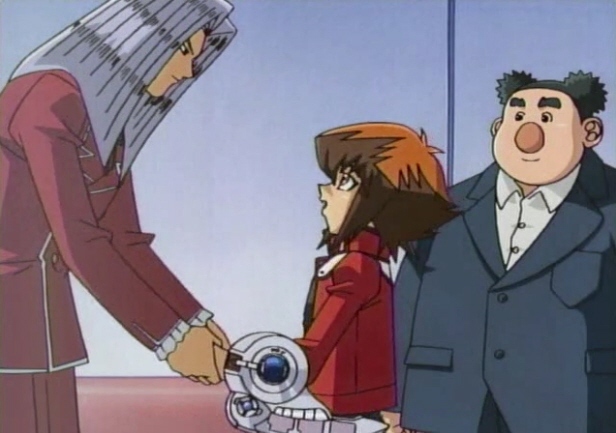 In the meantime, Pegasus sits with Kaiba and happily accepts his proposal to develop the holographic system, as they watch Sam defeat and humiliate Keith. Pegasus is also present at the regional Duel Monsters championship in Japan. He hands the prizes to the winnerWeevil Underwood and invites him to participate in his upcoming tournament. Pegasus is the inspiration for Dungeon Dice Monsters, a game that Duke Devlin created. After playing Duke in a game, Pegasus approves the creation of Dungeon Dice Monsters, wanting to expand it further. Upon Pegasus' request, Duke allows him to make an addition to the game. Pegasus adds "Dark Magician" as a monster, which Duke doesn't learn of until later. Pegasus also hacks into KaibaCorp's computer system and adds some of Dungeon Dice Monsters' data. Pegasus Dueling Yugi through the video. Pegasus sent Yugi a videotape and items needed to participate in the tournament. Through the videotape, Pegasus was able to communicate with Yugi on the spot and faced him in a timed Duel. Pegasus won and stole the soul of Yugi's grandfather as Yugi's Penalty Game. He forced Yugi to enter Duelist Kingdom to get back the soul of his grandfather. Pegasus sent his henchmen to take care of Kaiba, but he escaped, making it look like he jumped to his death. Pegasus henchmen kidnapped Mokuba, who had swallowed a key to a safe of documents Pegasus requires to take over KaibaCorp. Kaiba managed to get to the Duelist Kingdom island and demanded that Pegasus give Mokuba back. Pegasus responded by sealing Mokuba's soul in the "Soul Prison" card. He told Kaiba he would need 10 Star Chips to see him, like the other contestants. He gave him the 5 Star Chips Mokuba had previously stolen and told Kaiba that he must beat Yugi to get the other 5. Kaiba did so and prepared to Duel Pegasus using his Duel Disks, which he has designed to counter Pegasus' mind reading strategy. Pegasus agreed to use them, provided Kaiba also accepts his terms; to have Mokuba's body hold his Duel Disks. Kaiba refused to attack his own brother, so he Dueled Pegasus using a standard Dueling Arena. With the ability to read his opponent's mind, Pegasus defeats Kaiba and traps his soul in another "Soul Prison" card. 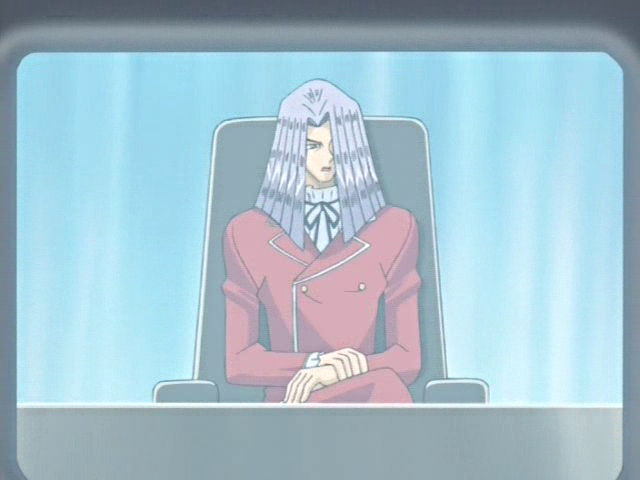 Pegasus watched the semi-final Duels; Yugi Muto against Mai Valentine and Joey Wheeler against Bandit Keith. Having been humiliated by Pegasus in their last encounter, Keith held a gun to Pegasus after losing his Duel and demanded the prize money. Pegasus opened a trap door, causing Keith to plummet into the ocean. As he planned, Pegasus ends up Dueling Yugi. 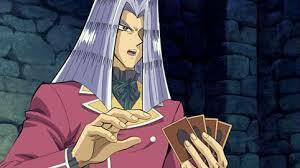 Were Pegasus to win, Yugi's soul would be sealed in a card. Should Yugi win, Pegasus would release the souls of Yugi's grandfather and the Kaiba brothers. The Millennium Eye initially gives Pegasus a massive advantage, but Yugi and Yami Yugi are able to outsmart him by using a "Mind Shuffle" technique, where each of them play a card face-down and then switch to the other mind without letting the other know what card they played. After the Yugis destroyed Pegasus' card "Toon World", giving them a small lead in Life Points, Pegasus draws them into a Shadow Game. Although the game is too much for Yugi, causing him to collapse, Yami Yugi was still able to resist Pegasus's Eye with the aid of Yugi's friends reaching out to protect Yugi, allowing him to destroy Pegasus' monsters and win the Duel. After his defeat, a downhearted Pegasus leaves for his sanctuary where, true to his word, he releases the souls of Solomon, Kaiba and Mokuba, lamenting his failure to Cecelia. Shortly afterwards, Yami Bakura confronts him and challenges him to another Shadow Game, with their respective Millennium Items on the line. Weakened from his Duel with Yugi and Yami, Pegasus loses easily, and Yami Bakura takes his Millennium Eye. This causes Pegasus to fall into a coma, and his last appearance in the arc is being carried out of his sanctuary by Kemo, presumably for medical care. Pegasus's disappearance after Duelist Kingdom hinders the release of Dungeon Dice Monsters. Duke Devlin blames Yugi for Pegasus' disappearance and faces him in Dungeon Dice Monsters over it. Yugi manages to win using the "Dark Magician" Pegasus added, and shortly afterwards it is revealed that Industrial Illusions plans to take Dungeon Dice Monsters global. Duke uses Pegasus' additions to the KaibaCorp computer system to his advantage, by adding Dungeon Dice original monsters to his Deck when he is trapped in the Virtual World. Pegasus returns in the Waking the Dragons and gathers information onParadius company and the company's true intentions. Pegasus warned Yugi and his friends of the impending danger and also gives Yugi the card "Legend of Heart", a key card leading to the defeat of Dartz. His soul is taken by Mai Valentine, but is restored by the end of the arc. When Dartz Summoned the "Mirror Knights", Pegasus was one of the captured souls in the cards, along with Mai, Yugi, and Joey Wheeler. He is eventually freed after the The Great Leviathan is destroyed. Pegasus in Duel with Dr. Crowler and Chancellor Bonaparte. Some time later, when several cards stopped working on Duel Disks he hired Axel Brodie to investigate. WhenNightshroud, the one behind the dysfunctional cards (and much more), Duels Jaden for the fate of the world, he tells him about the origins of the universe. Among other moments, Pegasus' discovery of the Tablet of Lost Memories is shown. Pegasus about to get crushed by a falling building. Pegasus is the target of Paradox, the new antagonist in Yu-Gi-Oh! 3D Bonds Beyond Time. Here, Paradox aims to kill Pegasus using Yusei Fudo's "Stardust Dragon", eliminating Duel Monsters from existence in order to prevent his future from being destroyed by Synchro Summoning. 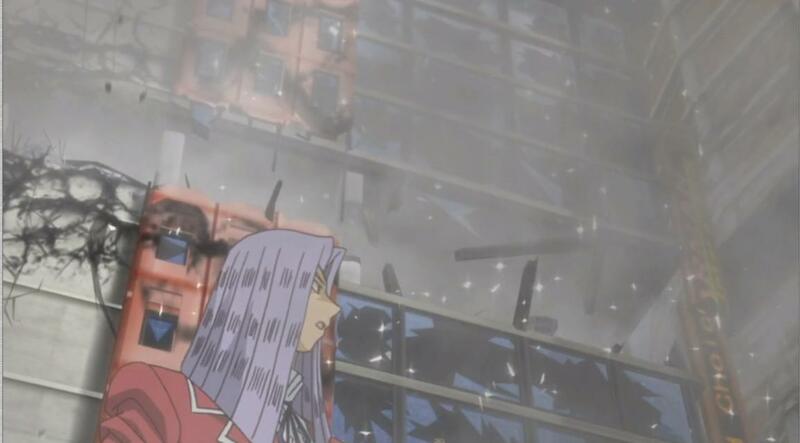 When Paradox came to Yugi Muto's time during a tournament that Pegasus was hosting, he used his Malefic Dragons to destroy buildings in the plaza, resulting in Pegasus' death as he was crushed under a collapsing building, along with several other bystanders, including Solomon Muto. Yugi then travelled back in time with Yusei Fudo and Jaden Yuki to a point prior to both Pegasus's arrival in Domino City and Paradox's, so that the three can defeat Paradox. After Paradox's defeat, Pegasus is then shown distributing cards at the event. Pegasus also appears in the non-canon Yu-Gi-Oh! The Movie: Pyramid of Light, which takes place after Battle City and before Waking The Dragons. Pegasus dreams of the impending danger as it enters his room to set its plan in motion. Soon after, Kaiba arrives and demands a way to defeat Yugi's three Egyptian God Cards since he knew Pegasus wouldn't let them go without a way to take them down. Pegasus admits to having a card that may work, but doesn't agree to Duel for it until after Kaiba wagers his three "Blue-Eyes White Dragons". Though he uses his beloved Toons, Pegasus is defeated after Kaiba uses "XYZ-Dragon Cannon" to destroy "Toon World" (which destroys the Toon Monsters as well) and attack him directly. Kaiba discovers two cards to take on the God Cards and doesn't believe Pegasus when he insists he only had one. Pegasus investigates the extra card and discovers the history of Anubis and arrives just in time to save Téa Gardner, Solomon Muto, and Mokuba from being crushed when Kaiba's Duel Dome starts to collapse. When Anubis reveals himself to Duel the Pharaoh and the building collapses further, Pegasus summons "Blue-Eyes Toon Dragon" and "Toon Dark Magician Girl" to catch some falling debris before they are (goofishly) crushed. Pegasus makes a number of appearances outside of the various Yu-Gi-Oh! anime and manga adaptions. He appears as an opponent in many of the video games, using his signature Toon themed Deck. His most prominent appearance in the video games is in Yu-Gi-Oh! Reshef of Destruction, in which Pegasus once again appears as the main villain. Having found an ancient stone tablet, Pegasus is possessed by an ancient creature known as Reshef the Dark Being, and renames himself "Sol Chevalsky". Using his resources, Pegasus summons forth all of his former minions, including the Paradox Brothers and PaniK from the Duelist Kingdom Arc, and sends them to claim the Millennium Items while he prepares to free the Dark Being from its stone prison. Ishizu Ishtar foresees the calamity that the Dark Being could unleash, and recruits Yugi, Joey, and the player's character to put an end to Pegasus' evil plans. They eventually succeed in freeing Pegasus and defeating the Dark Being, but Reshef attempts to possess him again. Saddened by his evil actions, Pegasus allows the Dark Being to take his soul, telling Yugi and his friends to seal him away with Reshef trapped inside of him. Pegasus ultimately accepts his fate, expressing his gratitude at having faced such powerful Duelists before he is sealed into the stone tablet. In all Japanese versions, Pegasus is known as Pegasus J. Crawford. In the English anime and manga, the name is instead Maximillion Pegasus. In the English Yu-Gi-Oh! The Duelists of the Roses video game, and in the instruction booklet for Yu-Gi-Oh! Forbidden Memories, his original name, Pegasus Crawford is used, while in the other games his English anime and manga name is used. Pegasus is unusual in that his English name is used in the English manga while mostYu-Gi-Oh! human characters keep their Japanese names in the English manga. In the video game, Yu-Gi-Oh! The Falsebound Kingdom, the character representing Pegasus within the virtual world of the game is named Pegasus J. Kroitzel. In Yu-Gi-Oh! Reshef of Destruction, Pegasus takes an alias. In the Japanese version, he takes the name Taiyō Tenma (天馬太陽, Tenma Taiyō). In the English version, he takes the name Sol Chevalsky. Maximillion, Pegasus' English name, may refer to the fact that he is a rich person. Pegasus uses a Toon Deck focused around the card "Toon World" which, in the manga and anime, is a one of a kind card that allows him to play special Toon Monsters. During Dueling Kingdom, aside from his Toon cards Pegasus utilizes control cards to disable enemy monsters, such as "Trap Displacement" and "Magical Neutralizing Force", and cards that can turn an opponent's cards against them, such as a combo of "Dragon Capture Jar" and "Dragon Piper", or "Doppelganger". These cards take full advantage of Pegasus's mind reading abilities to anticipate and counter his opponent's moves. As an extension of this control, Pegasus created the cards "Relinquished", "Thousand-Eyes Restrict", "Thousand-Eyes Idol", and "Dark-Eyes Illusionist" specifically for his Duel with Yugi, the cards having the ability to block enemy attacks and absorb the power of Yugi's monsters. On a CD based on the English dub of the anime, Yu-Gi-Oh! Music to Duel By, he sings "Face Up Face Down". ↑ Yu-Gi-Oh! Episode 117: "Noah's Final Threat, Part 1"
↑ Yu-Gi-Oh! GX Episode 92: "Duel for Hire"
↑ Yu-Gi-Oh! GX Episode 159: "The Truth Behind Darkness! Judai VS Fubuki"
↑ Yu-Gi-Oh! GX Episode 177: "Combo of Terror! "Zero and Infinity""